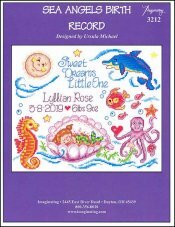 Sea Angels Birth Record [W6276] - $6.00 : Yarn Tree, Your wholesale source for cross stitch supplies. Cross stitch chart from Imaginating. Designed by Ursula Michael. Welcome your newest bundles with this sea-themed birth announcement! A sleeping baby rests inside of a seashell. Swimming around the sleeping baby is a sea horse, a whale, fish and an octopus. Personalize this design by stitching the baby's name, birth date and weight. Stitch count 135v x 110h. Stitched on #2936 Zweigart Aida 14ct White 59" wide or #8221 Zweigart Aida 14ct White 43" wide.